A few days ago, I posted about December's Magazine Freebies, one of which is a miniature size of Benefit's new They're Real! Tinted Lash Primer - so new, in fact, that it isn't actually available to buy in the shops yet; this is an ELLE exclusive for now. Now I wasn't a fan of the original They're Real! mascara for a few reasons; namely, I found the brush cumbersome and impractical, didn't really find the formula that impressive, and found it to be a complete nightmare to remove. Benefit claim their They're Real! Tinted Lash Primer "Works two ways! 1. Wear as a mascara primer to dramatically boost length and separation. 2. Wear alone to tint and define lashes for a natural, feathery look." The packaging is in keeping with the rest of the They're Real! 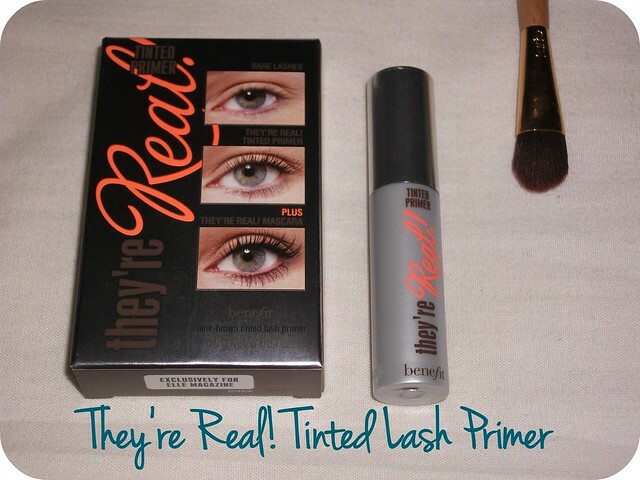 line; a silver plastic tube emblazoned with the They're Real logo in brown and orange, rather than the typical black, to reflect the mink-brown shade of the primer. 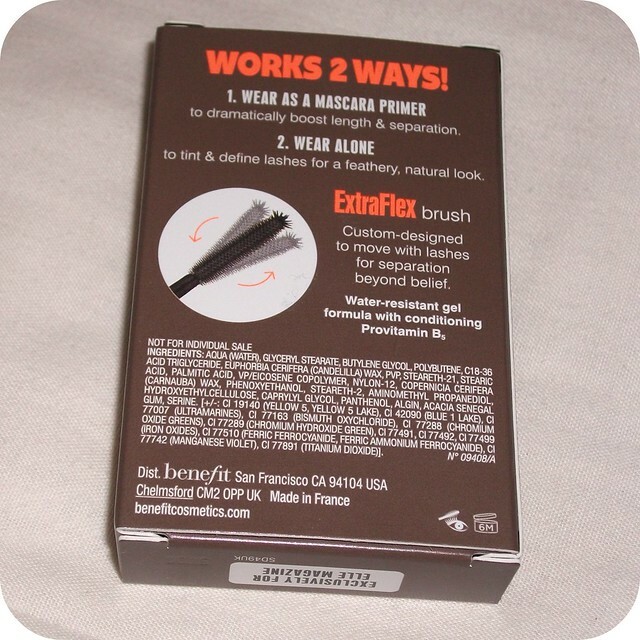 The brush is the same as the original mascara which is a huge negative for me as I found it really difficult to use. The formula is quite nice, it goes on smoothly without clumping and does work quite well alone to lengthen and define my lashes, as you can see below; They're Real! Tinted Lash Primer on the left of the photo, bare lashes on the right. I'd happily wear this alone as a day-to-day mascara. I don't actually have They're Real! 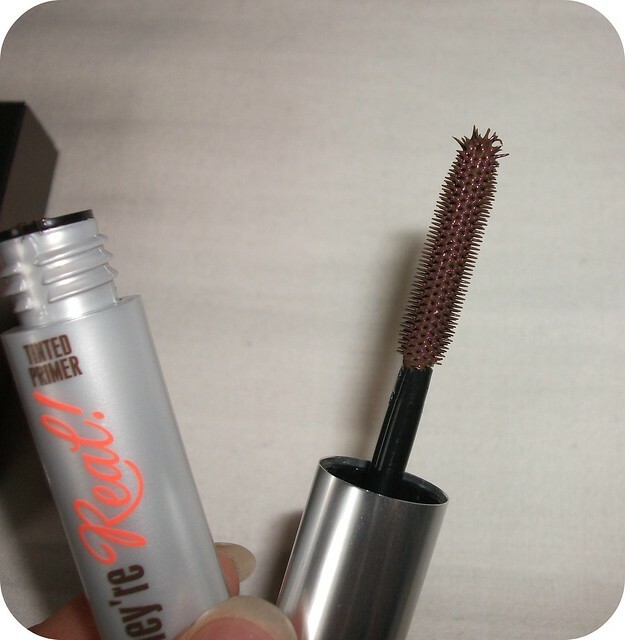 at the moment so I used this under Benefit's Roller Lash mascara, which I much prefer! At first I was quite impressed with the difference between the two eyes; again, I've used the primer followed by one coat of Roller Lash on the left below and on the right is just one coat of Roller Lash. 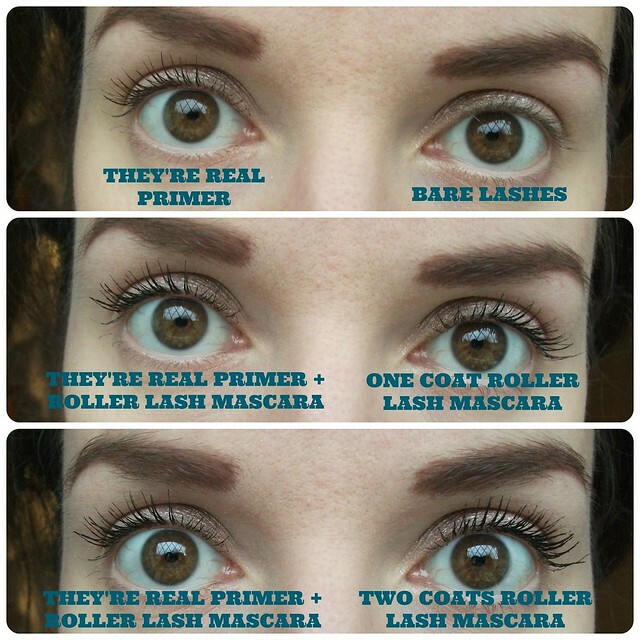 I do think there's a bit more volume and definition with the primer than with Roller Lash alone. However, I then wondered what the difference was from just applying two coats of mascara - and it turned out, very little! My lashes were a little more clumpy with two coats of mascara as opposed to the primer and mascara, but even that you'd only notice really close-up. For me, I don't think it's worth the hassle of using two separate products, particularly as I'm generally happy with my lashes with just one coat of mascara anyway! If you do have shorter or sparser lashes then this could well be worth a try to build up a slightly more natural-looking length and volume. Benefit's They're Real! Tinted Lash Primer is priced at £18.50 and is available now. Have you picked up Benefit They're Real! Tinted Lash Primer with ELLE this month? Will you be buying the full-sized product when it launches next month? I kind of agree, the primer kind of seems unnecessary. I love the way your lashes look with two coats of the roller lash mascara best! I didn't even know they were coming out with a lash primer -- so cool!